I have an eSpace that contains a web service. In that eSpace there's a test page that displays some results from the web service. However, there are two ways to get this info: directly by calling the action also called by the web service, and by calling the actual web service. Since the web service is referenced by the eSpace, all output structures appear twice in the structure list: once "native" and once referenced. The problem is that in the action that gets the results, in which an IF determines whether to get by action or by eSpace, the assignment of the web service result gives an error, as Service Studio says that the two records have different types (which is technically correct, but since one is the imported version of the other, they are actually the same). 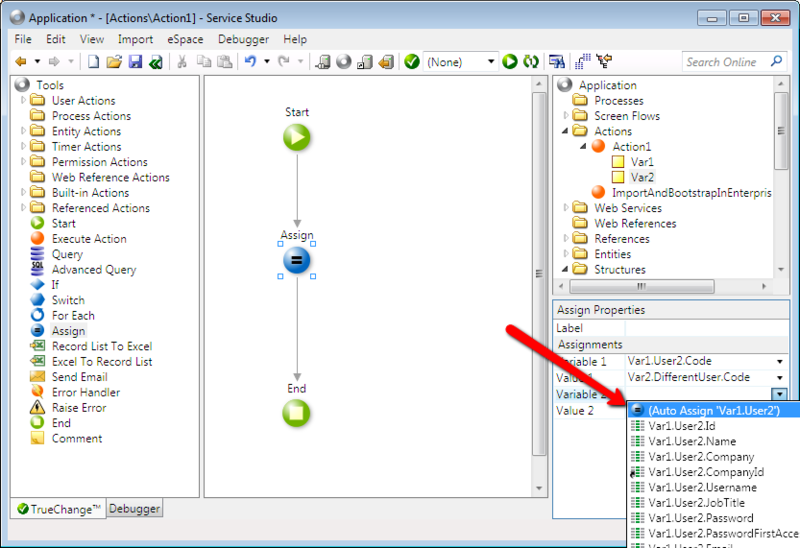 Is there any way to make Service Studio assign the structure? I don't feel like having to assign all the 50+ individual fields.